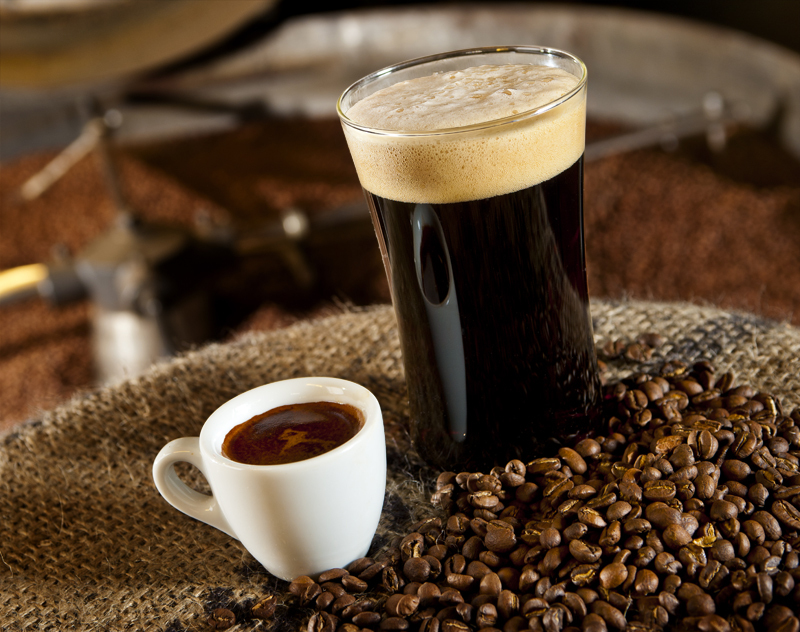 Montavilla Is Brewing Coffee and Beer! Collaborations between breweries are quite common these days, but Michael Kora (owner/brewer of Montavilla Brew Works) wanted an even more local collaboration to celebrate his immediate community. Kora called on Peter Emerson, owner of the Bipartisan Café, for collaboration ideas between coffee and beer. After a few ideas were hashed out, the two decided on a wonderful collaboration in conjunction with another recent collaboration between Finca Las Dalicias farm in El Salvador, Sokol Blosser Winery from Dundee, Oregon and Water Avenue Coffee from Portland, Oregon. Green coffee beans are aged in recently emptied wine barrels and take on the delicious flavors of Dundee Hills Pinot Noir. Then the beans are roasted, retaining an incredible complexity of Concord grape, oak, chocolate and nutty aromas. All these fantastic flavors blend harmoniously with a base Porter recipe brewed by Kora at Montavilla Brew Works. Three gallons of cold brewed Pinot aged coffee was added to conditioning tanks at the brewery and was packaged into half barrel kegs. The smooth, velvety-chocolate flavor of the Porter recipe is beautifully balanced with the Pinot aromas from the aged coffee addition. This is truly a special collaboration from farmer to vintner, to roaster to café and finally to brewer. Montavilla Brew Works is proud to be a strong neighborhood community supporter, and is excited to share in celebrating Bipartisan Café’s 10th anniversary in business this year. Cheers! About Montavilla Brew Works: The Montavilla neighborhood has warmly welcomed its newest business to 7805 SE Stark Street: Montavilla Brew Works. MBW is a ten barrel capacity production brewhouse with adjoining taproom and patio. After two years of city permit issues and a grueling construction build-out, Michael Kora (owner/brewer) has transformed a 1922 auto garage into a beautifully remodeled brewery and taproom. The brewery officially opened on July 17th, 2015 and has been an instant success in the Montavilla neighborhood with over 10 house beers on tap already. MBW specializes in seasonal lagers and a myriad of ale recipes from Kora’s past 15 years of brewing experience.